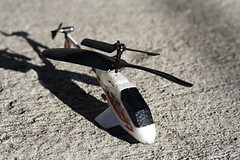 Sent by good my good friend winston, this litter bugger is really fun to fly around! Fine tuning it is a bit tricky. You have to keep the rear rotor blades perfectly aligned, else the helicopter body will also spin around. Once in flight you can use the left and right trim controls to stabilize the helicopter. The box also include a few strips of silver tape, that you stick on the front for added weight to facilitate forward flight. What's neat is that its virtually crash proof since the body is made of styro foam and the rotors are made of flexible plastic. Another nice touch is the helicopter charges via the RC remote, so all you need is a 6 AA rechargeable batteries. Its small enough that you can play it inside the house or and office cubicle for that matter. The blue blinking light inside the body makes it possible to fly this at night. It can also reach two stories high on an open ground. Watch out for the wind, this thing gets easily swept away.